Hydroponic grow systems allow you to get incredible results for growing plants indoors. They’re easy to use and most models come in kits that give you everything that you need, it doesn’t matter if you’re growing for the first time or if you’re already a professional, once you get your system everything will be easier. Note that we have categorized each model as either a DWC type or an EAF type. Deep Water Culture (DWC) models are easier to set up and maintain for beginners while the Ebb and Flow (EAF) are more efficient and better for plants that prefer dry conditions. Are These Complete Kits, Do You Need Anything Else? 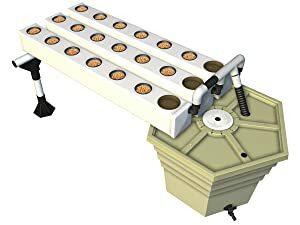 General Hydroponics’ GH 4720 model is one of the best hydroponic system out there, it has eight growing sites that can be filled with 11 gallons of water. If you wish, you can also expand this size up to 12, and all of this can be done on a single controller. Because of the number of buckets and their size, this system is the best one for users who have medium to large growing operations. You’re also receiving a 12-gallon reservoir and an 8-gallon controller unit, this model can be seen as a kit because you really get all that you need for starting out. Besides that, you’re also getting installation hardware and materials as well as the brand’s Hydroponics Flora series nutrients. This particular system is an EAF type, which means that it is more efficient and better for plants who need dry conditions. This time you’re looking at a DWC type system, which stands for Deep Water Culture. The benefit of DWC systems is that it is easier to set up as well as maintain, this is crucial for beginners who may not exactly know what they’re doing. This system is ideal for those who don’t need a huge number of growing sites and what something easy and cheap to start with. This particular model comes with four 5-gallon buckets that are FDA approved. Besides the main buckets, you’re also getting air pumps, air lines, air stones and net pot bucket lids. An interesting thing is that all buckets have a drain and water level indicator, which will be really helpful when you need to water your buckets. Medium and large sized plants can be grown in the buckets, but do note that large plants may not reach their maximum growth size. Coming from HTG, we have another DWC hydroponic system that comes with six growing sites that can fit 3.5 gallons of water. You’re going to save a lot of space with this model as the buckets offer really low profile. With this medium sized system, you’re getting net pot lids, two-inch air stones, and fifty feet of air tubing to connect everything. There is also a 1-liter bag of clay pebble grow medium included, the only thing that is missing here is the nutrients packs. The only downside of this model is that it features an air pump that is larger than most models, this means that you will have a powerful air pump that emits a ton of noise. If you have small to medium growing setups, then we recommend you this model as it offers you a good price and performance ratio. HTG’s bucket size is best optimized for medium sized plants. This time we’re looking at yet another General Hydroponics model, but this time around we’re looking at a type DWC model. 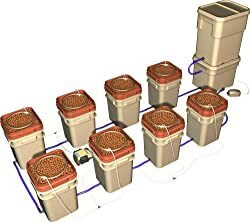 It is common for hydroponic systems to feature growing sites that are independent of each other, but with this model, you’re getting an all in one solution with 6 buckets integrated into one growing site. The system has six growing sites that can fit just one gallon of water, it also comes with a 17-gallon reservoir. It is very compact as it only needs about two by two feet of space. With a hexagonal reservoir, you’re getting maximum volume in a small space. With the kit, you’re getting lid inserts, net cups, pumping columns, CocoTek liners, an airline, clay pebbles, and some much-needed flora nutrients. 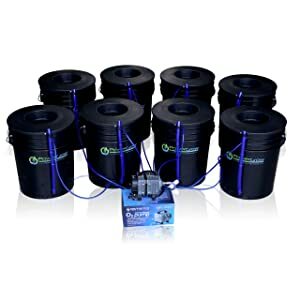 If you’re growing small to medium sized growing setups, then the PowerGrow DWC will be the optimal one for you as it has eight 5-gallon buckets. The kit is entirely expandable and it comes with various items such as an air pump, air liners, air stones, and basket lids. This model has drain and water level indicators as well, which will be useful later on. The air pump is a bit larger than other models which mean that you’re getting a powerful one, but don’t expect a silent environment as the noise it emits will be noticeable. All you need with this model is growing medium, nutrients, and of course plant babies, the rest is provided in this kit. 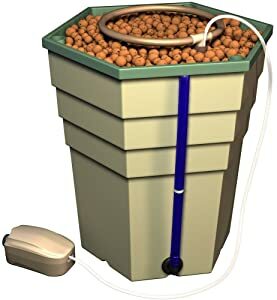 Note that since the buckets are 5-gallon types, you can even grow large plants and have them reach their maximum potential. AeroFlo made a strange but intriguing design, this is another all-in-one system that comes with amazing 18 growing sites. Even with its large reservoir that can fit 17 gallons of water, you’re still getting a powerful yet compact solution. All of the 18 buckets are split into three rows with each one being 4 feet long. In this kit you’re getting a pump, injection manifold, support structure to hold up the ends of the rows, CocoTek Coco cups, Hydroton, and a three-part flora kit. Note that we don’t recommend you to grow large plants with this system, as the buckets are only three inches across. You’ll be able to grow large plants but they won’t reach their maximum potential, instead, we recommend you to grow small plants that can grow up to three feet in height. 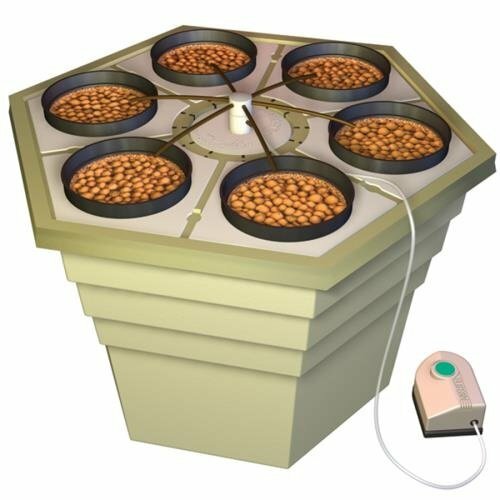 This system is also a great option if you have a system meant for larger plants, which you don’t want to waste by using it for smaller ones. Here we have a complete kit by H20toGro which will provide you everything you need for starting out, ranging from nutrients to growing mediums which will help you as a beginner. It is a DWC type setup that has an all in one design that only takes 18 by 12.5 inches of space. 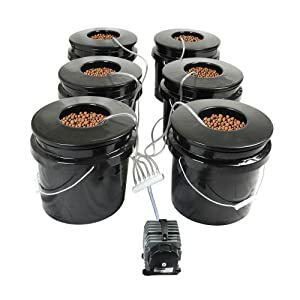 The buckets are very similar to the General Hydroponics Aeroflo when it comes to size, but this model has a fewer number of buckets, only 6. This, on the other hand, makes it a great system for users who have a small to medium sized farm. The buckets are FDA approved and are made out of food-grade polyethylene. There are water indicators featured on the reservoir which will help you see when your plants demand water. And don’t worry about any algae growing because of the indicator, as it emits a blue color which will prevent algae from growing. When it comes to weight, this system is compact as well since it only has 6 pounds when emptied out. 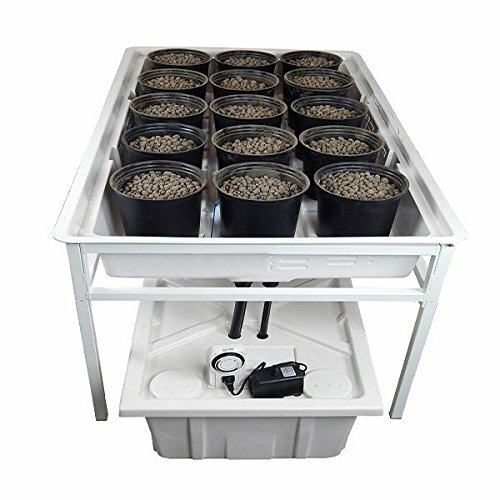 This EAF type hydroponic system is great for starters as it gives you everything you need. Viagrow provides you a setup with a 50-liter bag of their Viagrow grow rocks, all you need to do is add light and nutrients. The rocks included in this system are meant for flood and drain systems because they provide high oxygen access to plant roots. 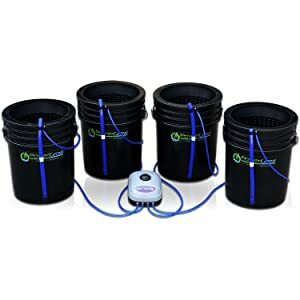 Viagrow’s system comes with ten 1-gallon buckets that are placed in a two by four feet flood tray, this is all placed over the 20-gallon reservoir. Both the tray and reservoir is made out of food grade material, so there is nothing to worry about. This system comes with a flood and drain tubing, a viagrow 211 submersible pump with a reusable filter and a grounded timer for watering and feeding. 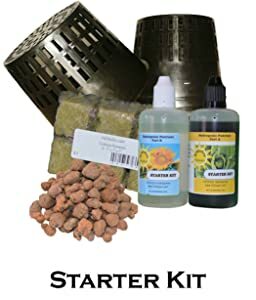 General Hydroponics tends to create kits for both beginners and advanced users, and this system is one of the best when it comes to starters. The hexagonal design is very space efficient as it only measures 16 by 13 by 15.5 inches. It has a three-gallon bucket that can grow plants of every size, but if you want your larger plants to reach their full growth size, then don’t expect that. The reservoir can only be filled by 5.7 gallons of water, note that this reservoir can be used by different General Hydroponics Controller systems. You can decide to use this kit as a stand-alone system, but you can also integrate it with other hydroponic systems as well. The AeroGarden Harvest is a bit different compared to the other hydroponic systems on this list. 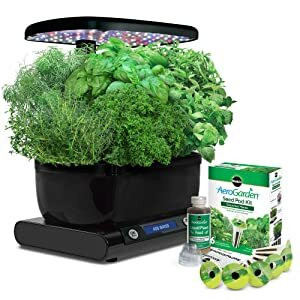 This model is a lot smaller than the other ones and it is aimed at home users who want to grow fresh herbs, vegetables, salad greens, and flowers. This makes it a great minimalistic choice for users who want to have fresh plants by their side. You can place up to 6 plants at a time in this single growing site. Everything is grown in water and all you have to do is add nutrients, 20-watt LED lighting is already included in this system and you can tune it so that it is compatible with the plant you’re growing. An LCD control panel indicator will show you when you need to add water and when you should add nutrients, note that a pack of nutrients is already included in this home-growing kit. Although the systems you’re going to buy aren’t going to be of an industrial level, you should still consider how much room you have in order to make sure that the system can fit. Most systems with a big number of growing sites can take up to an entire room, but some small systems can even be placed on a kitchen countertop. Since you’re converting from soil to water-based growing, the hydroponic system that you’re going to buy is going to need a lot of electricity to run. Even a standard 1,000-watt bulb in your system will cost you sometimes a few hundred dollars per month to maintain.The quality of those bulbs and other electrical components may even degrade in the coming years, so select something energy efficient in order to save money. If you’re buying a minimalistic setup that doesn’t feature anything that supports you when growing plants, you will end up with having to control how much nutrients or what temperature the plants need. This will need to be done most of the time, and in order to prevent you from doing it all by yourself, you can buy setups that have monitoring systems, which measure things like water level, temperature, humidity. More and more people are moving onto hydroponic systems instead of traditional gardens that use soil, and there is a reason for that! The first advantage of using water instead of soil when growing indoors is that you’re improving the growth rate of your plants. This is mostly because hydroponics provides your plants with more oxygen in their growth phase, which again improves root growth. Plants that tend to have a lot of oxygen in their root area can absorb nutrients much faster than when they’re placed in soil conditions. To make things better, in a hydroponic system nutrient will be mixed with water which will be sent directly to the roots at a much faster rate. On the other hand, plants grown in soil will take some time until the same nutrients reach their roots. Another great benefit is that users can control the hydroponic nutrients as well as the amount of each nutrient. This can’t be done within soil as it is already rich with all sorts of nutrients that can’t be controlled. The little packets of nutrients that you get with most models of hydroponic systems are already filled with everything that you need for your plants. The ability to control nutrients is a really great thing when growing, too little or too much of some nutrient type will always lead to a deficiency which will ruin your crops. But since you can control the exact amount of each nutrient, there is nothing to worry about since correcting these deficiencies is cheap, quick, and easy. You can also discover these deficiencies a lot faster and better compared to detecting them in the soil. One of the most important benefits to indoor growing with hydroponic systems is that you can control every single aspect of your growing environment. This ranges from pests and fungus to even diseases when you think about it, it’s like you’re playing the role of the God. The last benefit and advantage of growing plants in water compared to the soil are that it is just much more entertaining to do it. You can grow plants indoors and have a garden of your own in your home without having to step outside and get yourself dirty with all the dirt. Apart from that, it’s not just that you’re growing your plants at a more efficient rate, you’re also cleaning the air in your own home from a large range of toxins, this way you can combat the “sick building syndrome”. The fun in buying hydroponic systems is that once you pay for the model you decided for, you’re getting absolutely everything. This, of course, can’t be said for all models as some just tend to send you the bare bones, but in some premium quality models you can expect to get everything, some much-needed nutrients, an air pump, sometimes even plant growing rocks. If you’re lucky, perhaps you will even get a manual that also shows some valuable tricks and tips, as well as some do’s and don’ts. Once you get your hydroponic system kit, you’re only forced to set it all up, in most cases, you will see that it is kind of like setting up LEGO pieces since most models are beginner friendly. But on the other hand, you may find some advanced EAF models which aren’t really beginner friendly. Even when it comes to maintenance, you will have an easy job. Once you set it up you will only need to fill the buckets and reservoir with water. Some models even have indicators on either the buckets or just the reservoir, these indicators usually show the amount of water there is and sometimes they even warn you if you need to add more nutrients. But be careful with indicators, LED types which are in the blue spectrum are really good because they combat algae, other models with LED in other lighting spectrums can only allow them to further grow. History notes that the earliest food production in greenhouses possibly occurred during the rule of Roman Emperor Tiberius during the first century when they grew off-season cucumbers under “transparent stone”. This technology was rarely used after that time and there really isn’t any reported use during the next 1500 years. When the 17-century started, a lot of techniques were reportedly created that helped protect horticultural crops against the cold. Some of these devices included bell jars, cold frames, and glass lanterns. A hundred years later, the first glass house was built with the help of glass on one side which served as a sloping roof, later on, glass was placed on both sides. Greenhouse production was at that time only for the rich and privileged, meant as a tool which helped people get tasty and healthy vegetables during all of the seasons. But greenhouse production wasn’t fully established until the creation of polyethylene. 1948 was the year when the first polyethylene greenhouse cover was used. Professor Emery Myers at the University of Kentucky used it because the glass was more expensive and less durable. But the development of hydroponics was not as rapid as it should be. There was a great interest in it during the 1920’s in the US, but because of various difficulties, people didn’t see it as valuable or as efficient as using soil. After a period of about 20 years, the interest in hydroponics was renewed as plastic was created. Now in the modern era, all of the problems that prototypes of hydroponic systems had are now removed, making it more efficient and easier to work with water instead of soil. The interest of hydroponic systems has fallen during the 1970’s when the price of oil has heavily increased because it increases the cost of CEA heating and cooling as well. This has caused several bankruptcies in companies that invested in this technology and a lot of interest has decreased. But after 20 years the first interests in the best hydroponic system have been reported again.